Rebecca Clarke from Muirfield PS (but taught by Karen Harper). 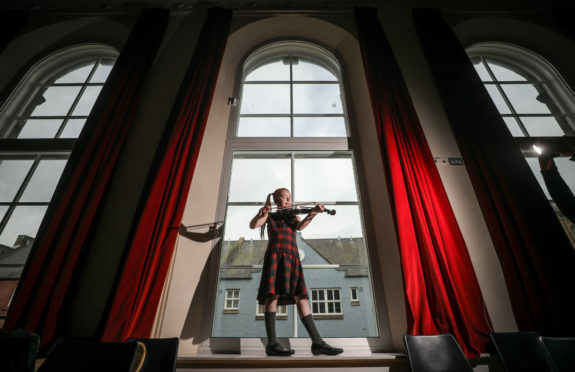 The invigilators have been drawn from across the musical spectrum and include Audrey Mattner, a graduate of Royal Scottish Academy of Music and Drama where she studied violin with Peter Mountain. Audrey has led numerous orchestras across Perthshire, Angus and Dundee and continues to perform freelance in orchestras and as a member of the Ferntower Ensemble piano quintet and has been leader of the Ruthven Festival Musicians for the last 30 years. Currently teaching for Perth and Kinross, Audrey is working with the Perth Youth Orchestra in preparation for their tour to Florence this summer. Festival Secretary Susan Robertson welcomed the positive feedback. She said: “It has been another excellent day at the festival, the very positive comments from the invigilators are really encouraging. School, orchestra or band – 1 St Johns RC High Orchestra, 85; 2 St Johns R C High Brass band, 83; St Johns R C High String Band, 80. Secondary school choirs – 1 St Johns R C High school, 167. Oratorio Solo – 1 Heather Gourlay, 87. Tenor Solo – Ruaridh Mathieson, 180. Operatic Aria – 1 Heather Gourlay, 87. Bass solo – 1 John Kerr, 181. Scottish Songs – 1 John Kerr, 92. Brass solo under 12 – 1 Findlay Simpson, 89; 2 Amelie Ingram, 88, 3 Reiss Banks, 87. Family Class – 1 Euan, Matthew and Lucy Crabb, 90. Advanced Instrumental Recital – 1 Lucy Crabb, 92. Violin Solo Grades 1-2 – 1 Robyn Jenkins, 86; Joint 2 Lydia Fernando, 85 Grant Morrison, 85. Violin Solo Grades 3-4 – 1 Sarah Campbell, 86. Violin Solo Grade 5+ – 1 Kit Storm, 88; 2 Ailsa Millar, 87; 3 Amelia Yeaman, 86. Instrumental duet (strings and/or piano) – 1 Kit Storm/Gavin Lee, 89; 2 Annah Cargill/Meghan Cargill, 87; 3 Ailsa Millar/Grace Matthews, 85. Cello solo grades 1-2 -1 Lauren Halley, 90; 2 Heather Stathdee, 89; 3 James Forbes, 88. Cello Solo grades 3-4 – 1 Cameron Mitchell, 86; Joint 2 Stephanie Finnie, 84; Ellie Soutar-Coffin, 84, Eve Crosbie, 84; Hannah Grieve, 84; Abbey Gersok, 84. Cello solo grade 5+ – 1 Zoe Rennie 89; 2 Gavin Lee, 88; 3 Amanda Blackwell, 87.